Democracy Now!’s features “Expanding the Debate” 2016 U.S. presidential debate coverage with a feed from the October 9th presidential debate. On Sunday, October 9, 2016, Democracy Now! offered 3.5 hour coverage from the U.S. presidential debate in St. Louis, MO. 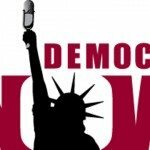 On Monday, October 10, 2016, Democracy Now! offered a special extra hour, expanding the debate to include candidates that were excluded from the debates.